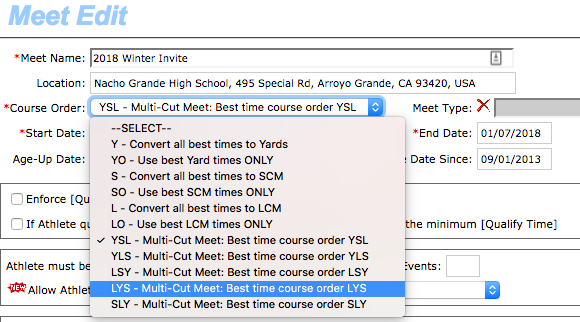 If you are entering a multi-cut meet with "cuts" in SCY, LCM and SCM, the meet host may set the Course Order to "YLS" in the Meet Setup and SwimOffice will first look at a swimmer's fastest SCY time for an event to see if it meets the SCY cut. If it does, then that SCY time is used as his/her entry time for that event. If it does not meet the cut, TeamUnify will then look at the swimmer's fastest LCM time to see if it meets the LCM cut. If it does, then that LCM time is used as his/her entry time. If it does not, it will use an eligible SCM time if one exists, or else that swimmer is not eligible for that event in that meet. Other possible course orders are YSL, LSY, LYS or SLY. Please also note if the swimmer has an SCY time, LCM and/or SCM time and two or more qualify, TU will use the SCY time first even if the LCM or SCM time is faster. If you want it to use, say, the fastest LCM time no matter what cut, you need to set the course to L instead so that it converts the fastest times to LCM. Please check with the meet host before doing this. Click Edit Commitment under the desired event. Click Edit by Event Declaration Setting. Change the Course Order drop down as desired.